Mark Suster has a good (and long as is his wont) post up on the topic of the changing structure of the VC business. “Capturing pro-rata” is sooooo important in early stage venture. You make 20 investments in a fund. One is going to return the entire fund. Two more are going to return it again. A few more are going to have strong outcomes and return it again. The rest are noise when it comes to fund returns (but you better not treat them like noise). Guess what? Early stage VC is a lot like poker. You want to go all in on your best hands. And if you make a seed or Series A investment, you get something called the pro-rata right. That means you get to invest an amount in every private round going forward that allows you to keep your ownership at the current level. A pro-rata right in Facebook, Twitter, Dropbox, Airbnb, Uber, ……….. is worth a lot. And early stage investors get those rights for free in the early stage rounds. At USV, we recognized this early on but did not know what to do about it. So we let our pro-rata rights go unused in Zynga and Twitter because we did not have the funds to take those allocations. Brad agitated about it. It bugged him. I was also unhappy about it but did not want to increase our fund size so that we could take these allocations. I strongly believe in small fund sizes. It’s a core of our strategy at USV. So we came up with The Opportunity Fund. It’s a companion fund that is designed to “capture pro-rata” as Mark puts it. We raised our first one in late 2010 and our second one earlier this year. It has been a big success. It is now so much a core of what we do that we now raise an early stage fund and an opportunity fund as a pair. You can’t invest in one without investing in the other. They have different economics for the LPs because they require different amounts of work on our part and because we don’t want to commit to put the entire Opportunity Fund to work (we did not put the entire initial Opportunity Fund to work). 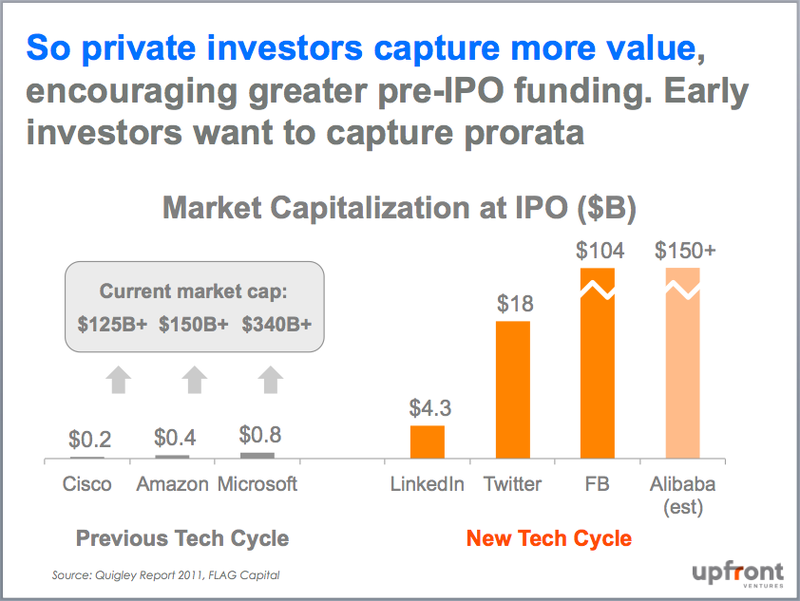 When a company hits escape velocity, the investors in the inside are the first (after the entrepreneurs) to realize it. And if you’ve watched hundreds of rockets go up in your career and dozens hit escape velocity, you start to be able to smell escape velocity coming. That means that “capturing pro-rata” is an opportunistic thing. Seeing something before others see it is one of the few legal and sustainable ways to make money that I know of in the investment business. And so having a vehicle to do this aggressively is a huge weapon in the hands of an experienced VC firm. Yes it is true, as Mark points out in his post, that public market investors are also coming into the private markets in a big way to capture all of this valuation expansion that used to happen in the public markets. But they do not have the one thing that we have – the pro-rata right. And so using it becomes even more important. I am glad that Mark took the time to write his post on this topic. It’s a big change that has happened fairly quickly in the early stage venture capital business (all post financial crisis) and the ramifications of it are important to entrepreneurs, VCs, public market investors, and LPs. I’m very pleased that USV has been early to this theme and a thought leader in it.